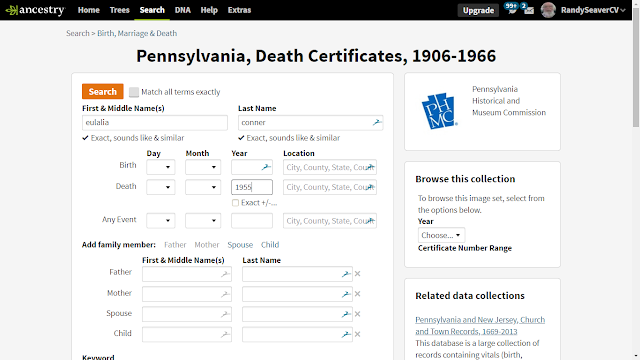 Genea-Musings: Something's Wrong With Ancestry Pennsylvania Death Certificates Search - FIXED! A reader emailed me saying that something was wrong with the Ancestry.com search results in the Pennsylvania Death Certificates, 1906-1966 record collection. So Eulalia Conner died on 19 May 1955 in Delaware County, Pennsylvania. Only one match was found for an "Exact" search, and it is for none of the three search field entries. How does this happen? 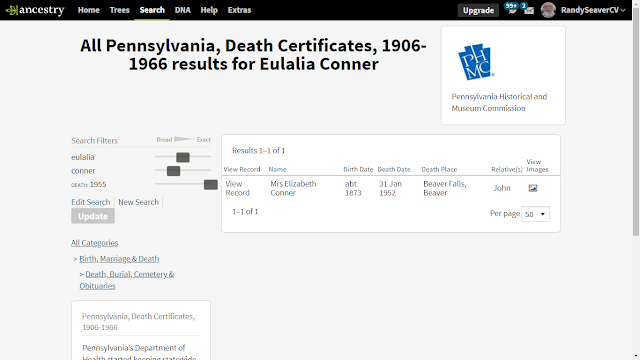 There must be some corruption of the index that doesn't find Eulalia and provides a link to another death record. Does this happen to any other researcher for this person? Or your own search target? I hope Ancestry.com corrects the problem quickly. How can I trust any search I do in this record collection? I will update this post when, and if, it gets solved. 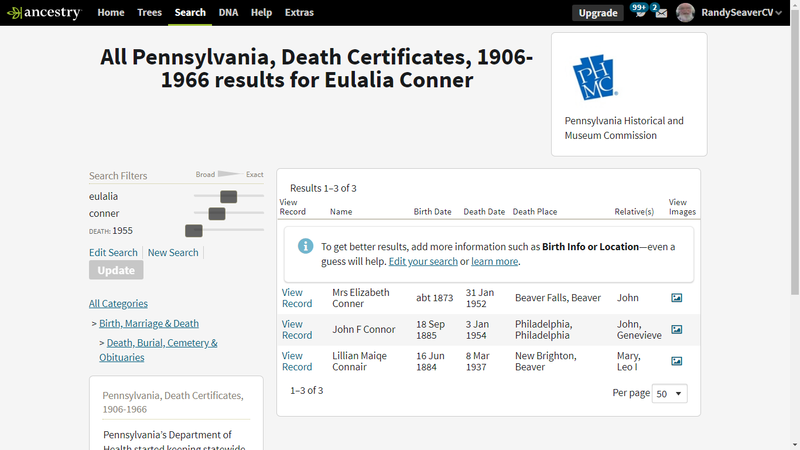 UPDATE: My reader also emailed the Pennsylvania Historical and Museum Commisson (PHMC) on 9 April, and they responded saying that they were aware of the problem on Ancestry. 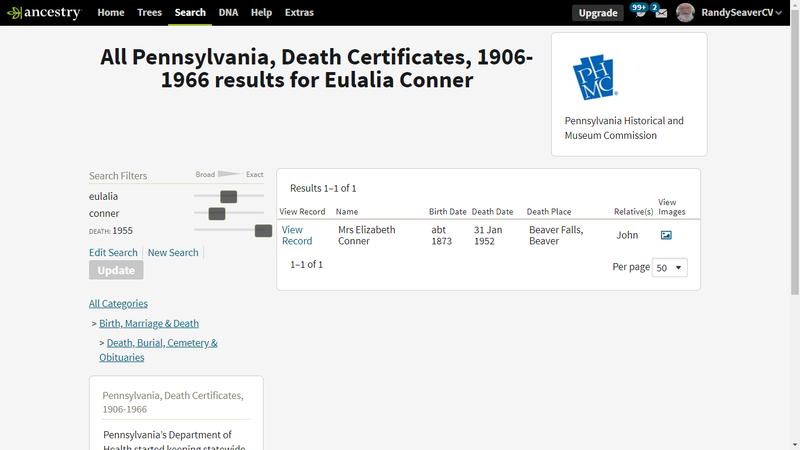 Today, the problem with the search and index for this record collection on Ancestry.com was fixed. There is also a problem with the indexing of Ancestry's NYC birth index (New York, New York, Birth Index, 1910-1965) Random months are missing from the index, so if you search for an exact date of birth for say September 23, 1930, only the results for Brooklyn come up, no other boroughs. I brought this up to Ancestry through the 800#, Twitter and by reporting individual record errors 6+ months ago, but no one seemed to understand the problem. Pennsylvania residents should complain to the Pennsylvania Historical and Museum Commission. 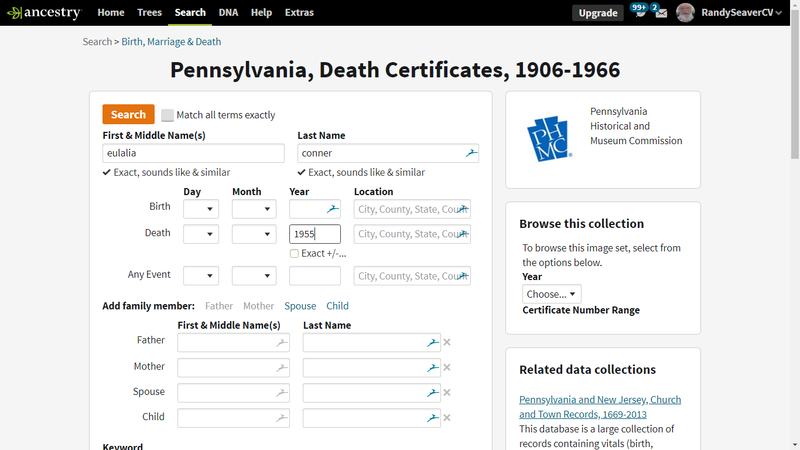 Ancestry is supposed to be supplying this service to Pennsylvania residents and its not working. 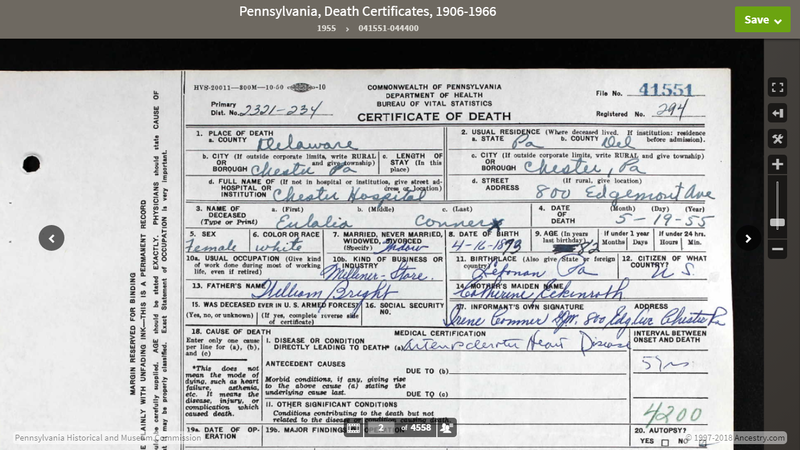 I noticed the same problems with the Pennsylvania Death Certificates this past weekend along with some of my searches on specific census (mainly 1920 & 1930). I just figured that Ancestry was having some hiccups.